Board games can be used as entertainment and for educational purposes to help children become immersed in the process of learning. 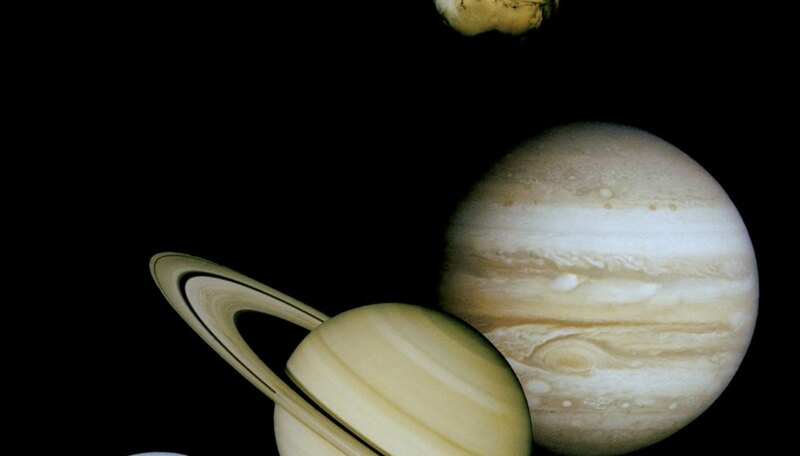 Make your own board game to teach children about the planets. Use facts about the solar system and your imagination to create a fun and engaging game that will get kids excited about exploring their universe. Brainstorm a list of ideas and associated words about the planets and our solar system and write them down on a piece of paper. While you are brainstorming, come up with ideas on how players will win the game, such as by visiting each of the planets in the solar system to obtain scientific data before returning to Earth. Make a chart on a new piece of paper that has eight columns. Label the columns "game pieces," "decisions," "risk," "conditional rule changes," "random events," "goals," "shortcuts and setbacks" and "obstacles." Game pieces are the markers that are moved on the board. Decisions are the choices that players are forced to make during game play, such as which path to take. Risk is what bad events could occur during a choice of game play. Conditional rule changes are any conditions or rules that could change during game play, such as by drawing a card. Random events are challenges that come up during game play. Goals could include reaching a specific planet or traveling to all the planets and returning to Earth. Shortcuts are quicker paths to goals that may be more dangerous but give the player a reward if he is successful. Setbacks are being forced to move back a few spaces on the board, or not being able to move during the next round of play. Obstacles are the events or objects on the game board that players need to overcome in order to reach their goal and win the game. Take the words from your brainstorming and write them down in the columns where you think that they would best fit. For example, if you wrote down "space ship, this could be placed in the "game pieces" column; "comets" might be listed in the "obstacles" column. Study your lists of words and match them up with ways they could be utilized as you build your board game. Draw a rough sketch of a game board that has a path of squares or circles that goes around all of the planets in the solar system. Write "start" at the beginning of the path and "finish" at the end. Draw a shortcut to certain planets that are further away from the Earth such as Uranus, and write down obstacles or risks that will occur if a player decides to go on that path near it for reference. Write the obstacles onto the path where you think they would fit, such as asteroid fields or the rings of Saturn. Write in setbacks on certain squares of the path; be sure to space them out evenly on the board to ensure that the game is fair to play. Take your chart with a list of random events, setbacks, obstacles and conditional rule changes and decide how to make them into cards. Once you have determined how certain events will change the rules of the game, write them down on card stock. On the board, write down "draw a card" in some of the squares of the path. Write down the rules for game play, such as collecting scientific data from the planets with a scan card that is picked up only when you land on a planet on the board. Each scan card could have a different scientific fact about the planet. Some game play events, such as a solar flare storm or engine trouble, could be caused by rolling a specific number on a pair of dice, such as a six or two ones. When the dice are rolled and the number comes up, the player may have to return to the closest planet on the board, or remain on the square they are on for two turns while the ship's crew repairs the engine. Draw the game piece designs based on your final decision for a game piece. When you find a design you like, draw it on a piece of card stock. Fold the card stock so that it can stand up on its ends. Draw your final game board on poster board with a pencil, then go over the pencil with a permanent marker. Make copies of the game pieces so that four or more people can play the game. Make final copies of the game cards and event cards. Free clip art and public domain pictures -- which are no longer protected by copyright and can be used by anybody for free -- can be found on the Internet and used for your board game. How to Make a Board Game From the Book "The Westing Game"